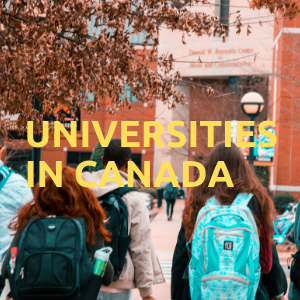 Universities in Canada - List of Universities in Canada by provinces/territories. Each applicant is normally required to pay an application deposit of CAD $100. Department of Earth, Ocean and Atmospheric Sciences Very nice program, not easy to get an admission offer! For MSc admissions minimum TOEFL requirement is 100 or IELTS score of 7.0. GRE is optional. All PhD students are funded. MSc program tuition fees per year is around $5000 (for international students). Geological science is one of the top major to study in Canada. Average age of students admitted is 32 yrs. Typical undergraduate grade point average (GPA) is 3.3 to 3.5. Dept of Computer Science Applicants for any of the graduate programs in Computer Science who do not have a degree from a Canadian University are normally required to submit their General GRE (Graduate Record Examination) results. We consider the GRE scores together with other documented evidence of academic strengths, such as transcripts and letters of reference, and normally require a minimum total a score of 2000, distributed about equally over the tested subject areas (V, Q, A). Minumum required TOEFL score is 88 or IELTS score of .0. Financial Support is provided to students who are enrolled in full-time MS/PhD course. Highly recommended program! Waterloo Engineering is the largest engineering school in Canada. International students are important members of the family of University of Waterloo There are more than 4,300 international students from more than 90 countries studying at the University of Waterloo every year. You can get all applications for the University of Waterloo online by the Ontario Universities Application Centre (OUAC). You can apply using the 105 application form. For fall term admission, the 105 form is available in late September. (E.g., applications for fall 2014 are available in September 2013). If you're applying for Engineering at Waterloo including Software Engineering, you are eligible to apply to only One Engineering program. You can specify your other Engineering choices on the Admission Information Form (AIF). International students are eligible for all programs offered by the University of through either the regular or co-op systems of study. University starts sending Offers of Admission in December for all the fall term applicants, but the majority of offers will be sent by late May. Estimated total first-year costs for 2 terms/8 months for international engineering students is ~$40,000-$48,000 additional other costs include $2,900 for estimated costs of telephone, entertainment/recreation, personal care, and laundry/clothing.